This is the movie about nine guys who break out of prison that manages to be both funny and sad that we’ve all been waiting for! It’s a bit of a dirty trick since you get lulled into the rollicking road trip aspect of the film following their exploits as they search for some buried treasure that the tenth guy in their cell (he didn’t get to go on their field trip for some reason) has clued them in on only to have the carpet pulled out from under us ever so slowly and deliberately as the movie’s second half unfolds. After spending an enjoyable hour with these guys as they hurtled toward Mt. Fuji Elementary School where the Counterfeit King said the loot was buried in a time capsule, the movie becomes a series of jolting encounters that details the fates of the escapees as the Japanese public becomes increasingly obsessed with their whereabouts. 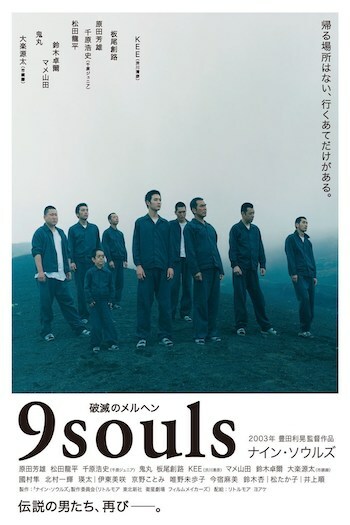 Toshiaki Toyoda who made the well-crafted, but ultimately too-derivative disaffected high school youth melodrama Blue Spring puts it all together with 9 Souls, delivering a highly entertaining movie that morphs into an engrossing one as it goes along. Its portrayal of these convicts, most in prison for some brutal crime or other, as flawed men who still retain small-scale dreams allows the audience to connect with them as they spend time on the road assuming the aspects of a large, dysfunctional, felonious family, prone to bickering about pointless things just like all families. Shortly after Michiru (Blue Spring star Ryuhei Matsuda) is delivered to prison for killing his father and placed in a cell with nine other inmates (it was the least crowded), everyone except the Counterfeit King breaks out, apparently through a sewer. 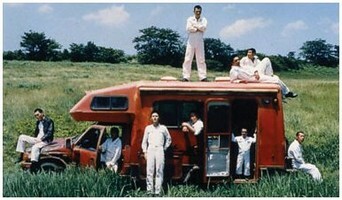 Led by the master escapist Shiratori (you’ll remember him as the dwarf gardener in Blue Spring), they manage to commandeer a beat up camper after initially tricking the obviously dimwitted driver into thinking that they’re some sort of marital arts team in training. Following a rendezvous with some sheep, they continue to make their way to the school where they believe all this money is buried. As with all good road movies, the trip is neither particularly swift nor uneventful. Stops are made at various points along the way mostly to get something to eat. One stop finds us at the house of someone Torakichi (the cons’ leader) knows who has just married a gal from the Philippines, so he isn’t terribly keen on putting up a camper full of Japan’s Most Wanted. There’s also the trip to the restaurant where they all eat while in drag and Torakichi ends up in a shouting match with the owner while dressed as one of the ugliest women you’ll see this side of Russia. That Torakichi is unfailingly morose and has zero sense of humor only makes the scene that much funnier. Torakichi also doesn’t like tardy people and so we have several moments where he orders the camper driven off while some fellow inmate is running down the street after them, pleading for them to stop. These guys aren’t exactly the well-organized crew of sadistic killers the Japanese media is making them out to be on all their newscasts. It shouldn’t come as any surprise that the Counterfeit King’s treasure hidden in the grade school time capsule isn’t what anyone was expecting or wanted (it’s given to Michiru because no one else even cared) and once that happens, the group slowly begins to go their separate ways. Almost to a man, every one of them decides to try to relive or reconnect with something from their past and almost to a man, this leads to tragedy. Nine people though, are too many to focus on. You barely have time to get a handle on all of them and a few of them you were able to differentiate just because of their physical build (the dwarf, the old guy, the young kid, the fat guy) which left several younger skinny guys that seemed to blend together every once in awhile. Really, how many of the Dirty Dozen can you recall? And of the Seven Dwarves, how many can you remember contributing to the story in any appreciable measure? Cut the cast to about six guys which would allow you to deepen the characters (and let’s be honest – there wasn’t much opportunity to get inside these characters) and keep the pacing of the film from slipping as it eventually came to a close.